“Bioscience engineers at KU Leuven have created a hydrogen gas panel that produces hydrogen gas from moisture in the air. After ten years of development, the panel can now produce 250 litres per day – a world record, according to the researchers. Twenty of these panels could provide electricity and heat for one family for an entire winter. Under a watery sun, Professor Johan Martens and his research team roll the hydrogen gas panel onto the lawn in front of the Centre for Surface Chemistry and Catalysis at KU Leuven. The device looks like an ordinary solar panel. The engineers have attached a flask with water to the device so that we can see the hydrogen bubbles escape. A meter indicates the quantities. After a couple of seconds, the first bubbles begin to rise to the surface. Hydrogen gas is an energy vector that can easily be stored and transported, and it can be converted at will into both electricity and heat. The gas doesn’t release any greenhouse gases or toxic substances, provided that you use clean energy to produce it. That’s what Professor Martens’s team has developed: a device that turns sunlight and water vapour into hydrogen gas in a sustainable way. A traditional solar panel converts between 18 to 20 per cent of the solar energy into electricity. If you then have to use that electric power to split the water into hydrogen gas and oxygen, you lose a lot of energy. 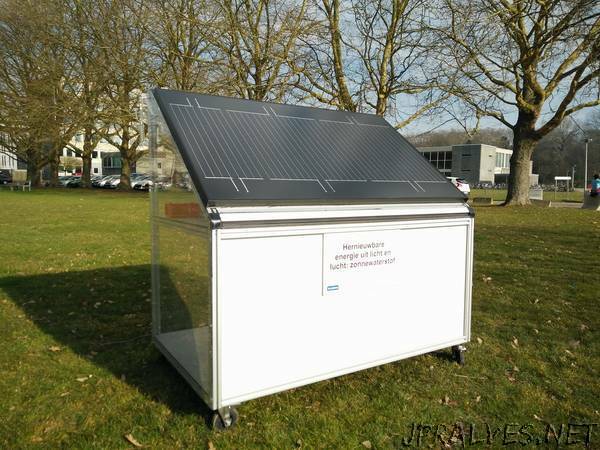 The KU Leuven bioscience engineers solved this exact problem by designing a hydrogen gas panel of 1.6 m² that converts 15 per cent of the sunlight straight into hydrogen gas. That’s a world record in the category of devices that don’t require precious metals or other expensive materials (see below). Most hydrogen gas is produced using oil and gas – not a big win for the climate or the environment. We believe this is about to change. Hydrogen gas from renewable energy sources – green hydrogen gas – has been a promising prospect on the energy market for years, but the real breakthrough hasn’t happened yet. Hydrogen gas is considered to be expensive and difficult to produce and store. Today, most hydrogen gas is produced using oil and gas. ‘Grey’ hydrogen gas, in other words – not a big win for the climate or the environment. The KU Leuven researchers believe this is about to change. Last week, Toyota announced that it wants to produce hydrogen gas with a prototype designed by Johan Martens’s team in 2014. This device is a little screen (10 cm2) that the engineers will scale up to a large panel. Of course, all this is still based on calculations. But soon, the researchers will start a pilot project to field-test the theory. In any case, a benefit of hydrogen gas is that it can replace fossil fuels. Around 80% of our energy comes from oil, gas, or coal. We need to replace these sources if we want to tackle global warming, says Jan Rongé. However, hydrogen gas comes with risks of its own. Like most fuels, the gas is highly flammable. This poses a danger, especially in closed spaces. At the same time, it’s also a light gas, so when it escapes, it will rise up immediately instead of spreading over the ground. In any case, the new prototype of Johan Martens’s team is ready for field testing outside of the campus. For the first project, we’re driving to Oud-Heverlee, a rural town in Flemish Brabant. The house we visit is well insulated and gets most of its power from solar panels, a solar boiler, and a heat pump. It is not connected to the gas grid. It only uses power from the grid in the winter. Soon, 20 hydrogen gas panels will be added to this mix. If all goes well, more panels will be installed on a piece of land in the street. This will allow the other 39 families in the street to benefit from the project as well. The hydrogen gas produced in the summer will be stored and converted into electricity and heat in the winter. Hydrogen gas is easier to store than electricity. Buffering electricity requires batteries that are expensive and slowly lose voltage as well. Therefore, it’s not a good idea to buffer electricity from summer until winter. With hydrogen gas, it’s a different story. The hydrogen gas produced in the summer can be stored in an underground pressure vessel until winter. One family would need about 4 cubic metres of storage. That’s the size of a regular oil tank. We wanted to design something sustainable that is affordable and can be used practically anywhere.